The emblem represents the figure of an athlete, using typically Australian shapes and colours. The boomerangs and suggestions of sun and rocks, together with the colours of the harbour, beaches and red interior invoke the unique Australian landscape and its original inhabitants. 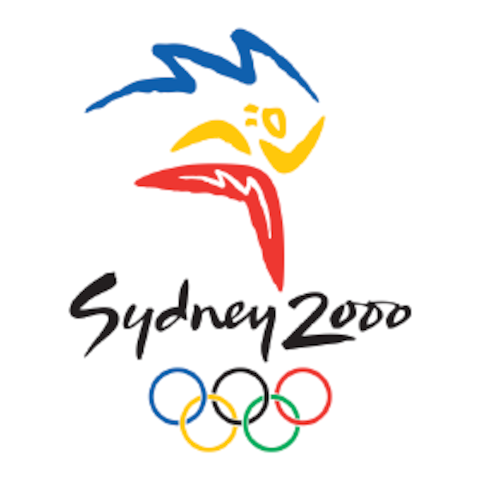 The flash which transforms the silhouette of Sydney Opera House into a trail of smoke from an Olympic torch recalls the emblem of Sydney’s Olympic candidature. Cathy Freeman, Olympic participant in athletics (1992, 1996, 2000), gold medallist in Sydney 2000 and silver medallist in Atlanta 1996. In Australia, the Community Torchbearers programme allowed the Australian general public to nominate people who were notable for their achievements or worked for the common good. Through this programme, 6,000 torchbearers were selected from among a total of over 43,000 nominations. The rest of the torchbearers were either chosen through sponsors, media partners and the Organising Committee, or were Olympians. About 7 per cent of the torchbearers were of Aboriginal and Torres Strait Islander heritage. 1,696 km on land and 463 nautical miles in Greece, ~17,000 km in Oceania, 27,000 km in Australia. Greece, Guam, Palau, Federated States of Micronesia, Nauru, Solomon Islands, Papua New Guinea, Vanuatu, Samoa, American Samoa, Cook Islands, Tonga, New Zealand, Australia. Triathlon and taekwondo were two new additions to the Olympic programme. Susanthika Jayasinghe became the first Sri Lankan woman to win a medal, claiming bronze in the 200m.